A cashier counts bolivars at a money exchange in Caracas, Venezuela, Feb. 24, 2015. In July, President Nicolas Maduro smiled as he sealed a multimillion-dollar food import deal with his Uruguayan counterpart designed to combat shortages ahead of Venezuela's legislative elections. But instead of paying the $267 million as agreed, Maduro's government deposited in November under a fifth of that amount, according to Uruguay's government. That put a brake on the shipments to Venezuela. Uruguayan exporters say just a third of the milk and a tenth of the cheese agreed on were dispatched to Venezuela in October, well under the roughly 235,000 tonnes of food contracted in the whole deal. Hit by recession and a slump in oil prices, Venezuela faces a cash crunch, hurting Maduro's bid to fill shelves with imported meat, dairy products and medicines before the Dec. 6 legislative elections that his socialist government may lose. Providing Venezuelans with plentiful, price-fixed goods has worked in the past. In a major pre-Christmas campaign in 2013, when the price of oil was still high, Maduro sent soldiers to occupy stores and ordered that the price of electronics and clothes be slashed, helping his party win regional elections. In an echo of that strategy, state television is now broadcasting the arrival of toys, pork, and even Christmas trees to Venezuela's Caribbean shores, with state officials vowing the goods will be sold cheaply and benefit all families. "Families wanted these, and here they are!" beamed Vice President Jorge Arreaza at one event, unveiling 48,000 imported Christmas trees at a port outside Caracas. Yet five sources who work in Venezuela's two main ports say total imports are in fact down about 60 percent from last year. FILE - People wait in a line to buy staple goods outside a supermarket in Caracas, Venezuela, Oct. 20, 2015. Maduro says Venezuela has lost more than 60 percent of the hard currency it enjoyed in 2014 due to the oil crash. Those losses have punctured the tried-and-tested election strategy of supplying cheap goods to its largely poor voting base. Anger is mounting over worsening shortages, now Venezuelans' number one worry according to polls, and threatens to erode Maduro's support among the poor, who spend hours in line for scarce products. Payment delays have also worried important trading partners. Venezuela paid $50 million of its debt to Uruguay in November, said Tabare Aguerre, Uruguay's minister for cattle, agriculture and fishing Though it pledged to pay the rest "gradually", producers say they had no choice but to freeze shipments. "We had understood it would be just one complete payment," Ricardo De Izaguirre, president of Uruguay's National Milk Institute, told Reuters, adding that chicken, rice and soy will not be shipped until more is paid. "Three cheese companies have the remaining orders in fridges waiting to go." Uruguay is not alone in waiting. As of October, Venezuelan state importer monopoly Corpovex had only paid for $6 billion of the $19 billion of goods it ordered this year, according to an internal Corpovex document seen by Reuters. The entity is indebted to 74 percent of the companies it purchases from, added the report dated October. The majority of imports to Venezuela are now governmental, as the financial squeeze leads to fewer allocations of dollars for private imports. The government last year reduced by 32 percent its dollar sales for priority imports, like food and medicine, by the private sector as international reserves diminished, according to official data. This year, private economists estimate the contraction in preferential dollar sales to private companies will be around 50 percent. On a recent morning in Puerto Cabello, Venezuela's biggest port which receives both consumer goods and raw materials for industry, five ships were waiting to enter the port. "Two years ago you would have seen 25," Rafael Pina, a port worker, said as he took a break in a leafy square in front of the docks. "This isn't a shadow of what it used to be. Shipping companies are letting people go because of the low activity ...It doesn't feel like Christmas-time." Deliveries at Puerto Cabello dropped 26 percent between January and October compared with the same period of 2014, according to Thomson Reuters shipping data. In addition, the ships arriving have smaller drafts and, unlike in past years, companies are sharing boats to group smaller orders, according to a source at an international shipping company. La Guaira, the country's second biggest port just an hour from Caracas which receives mainly consumer goods, processed 42 percent less merchandise in the first nine months of this year compared with 2014, according to data from state port administrator Bolipuertos. "Only the government is importing," said an executive with another leading foreign shipping company. "But a year ago a ship from Brazil would arrive every 10 days with something for the government, and now one arrives only every 25 days," he added, asking not to be named because he is not authorized to speak publicly on the matter. Behind the scenes, high-profile ministerial visits have been going on for months to seal largely undisclosed commercial deals with fellow Latin American countries. In June, for instance, powerful National Assembly boss Diosdado Cabello and Finance Minister Rodolfo Marco traveled to Brazil to meet with JBS, the world's largest meat packer. After the visit, meat shipments from Brazil jumped eightfold in September compared with the same month of 2014. Overall exports, though, are still down this year by nearly a third. "The government wants to create the sensation of well-stocked shelves before the election," said opposition lawmaker Neidy Rosal, who has asked the comptroller's office to investigate state purchases. "This food isn't enough to go around, and that's why only the state will be providing it." 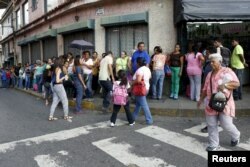 In the 23 de Enero slum, a "Chavista" stronghold, the government this month went door-to-door distributing numbers that allowed residents to line up at an outdoor state market to buy chicken, pasta, rice and milk. "But they haven't been back in two weeks," said Luisa, 82, who had unsuccessfully gone to look for food elsewhere.